Establishing a web presence has never been easier. 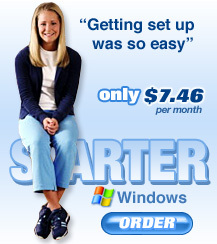 Build a dynamic web site quickly and easily with the Shared Windows Starter Plan. This hosting solution includes ALL of the features you need to setup and manage your web site including the SiteBuilder web site creator, email accounts, Webmail access, and more. Looking for Web Hosting v4.0? Click here.